Somewhere near the middle of the day I began to feel hungry and wandered into the kitchen. 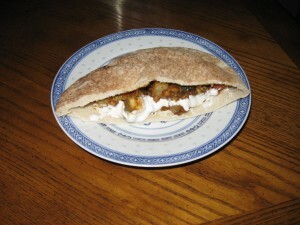 We had some tempeh, zucchini and pita pockets from a local bakery. Angela suggested these tempeh curry pockets and so we began. This is loosely based on a recipe I found a while ago but we made some changes to simplify it. These things are really delicious and pretty easy to prepare. Heat vegetable oil in large skillet over medium-high heat. Add garam masala and the other 1/2 t curry powder. Stir well and cook for another minute. This entry was posted on Tuesday, July 21st, 2009 at 9:41 pmand is filed under . You can follow any responses to this entry through the RSS 2.0 feed. You can leave a response, or trackback from your own site.